The live butterfly release at the awards ceremony was a fitting finale to a beautiful sunny day at the second Qu’en for Kids BBQ Cookoff and Family Festival in the Orange County Fairgrounds in Costa Mesa, California. As the butterfly in the open triangle box in my hand emerged and flew away, we heard our name being called for Grand Champion! Wow! We had come in first for Ribs, 2nd for Brisket, and 4th for Pork. <Results> Since we didn’t get called for chicken, I thought it would be like Stagecoach two weeks ago when we came in 3rd overall. We’re really jazzed with our first GC for 2009 amid 33 teams from as far as Arizona. This is a wonderful milestone as we’re headed out in two weeks representing California at the Great American Barbeque Invitational in Kansas City to compete against the best 60 GC teams in the nation. For many teams, this is a special annual event to help Kristie’s Foundation, a non-profit charity that supports end-of-life children. Kelleigh Strobel did a wonderful job as event organizer and we were all treated like VIPs. Many teams cooked BBQ for People’s Choice for the public who attended this event. 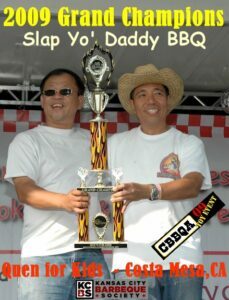 Congrats to my BBQ buddy Gary Notley for winning both Best Booth and People’s Choice! Kristie’s Foundation has secured a 5-acre location to build the first end-of-life children’s hospice in America and we’re glad to be part of their fund raising efforts with this BBQ cookoff. Many thanks to the judges, Kelly and Kathleen for serving as KCBS officials, and all the volunteers and helpers. Congrats to Vince and Alexa for RGC and to all those who took a walk. I glad Tom of Whiskey Ranch came in 7th and edged out his wife Jennifer of Smoked to the Bone at 9th. If Tom lost again to Jennifer, he would have to wear her pink outfit to the next contest! 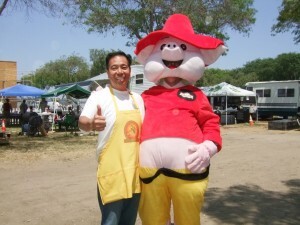 A special thanks also goes out to my competition meat suppliers: Roberto of T & H Meats in San Marcos, CA; and Harry Steward of Great American BBQ in Alameda, CA. And, as always, my sponsor John Jackson’s Stoker Systems worked flawlessly allowing us to get the results that we did. For the ROY teams John of Brazen BBQ and Dave of All Sauced Up, it was great to chat and exchange notes. To all the first time teams, I hope you all had a good time and will continue to compete including Mike, my rookie neighbor of El Fuego Fiasco BBQ team who edged me out in the chicken category! See you all next year!